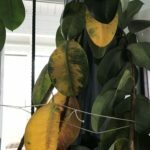 Can a rubber tree plant survive outside during fall and winter months? The rubber tree is a tropical plant, and can't survive temperatures lower than 45F for more than a few hours. If you are located in zone 10 or higher, rubber trees will grow outside, although they might be damaged when there's a cold winter. Any farther north and they need to be kept in pots and indoors for the winter.